One of my roadtripping friends took a mostly for work roadtrip with another friend up to London, Ontario, and brought this back for me. 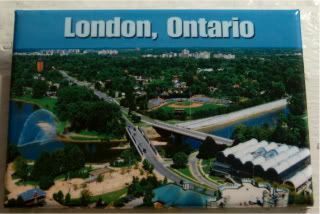 Settled by Europeans in the 1800s, London, Ontario, Canada, it's definitely taken its cue from its namesake in England, with both a Thames River and a Covent Garden Market. And, as it turns out, the town of more than 350,000 inhabitants has a lot to see and do. I'm not a beer person at all, but would so do the Labatt Brewery tour, it looks like fun! I don't have kids, but I would love to visit Storybook Gardens, cuz it just looks like a great place to hang. They have a few museums as well, and we all know how I love those. Also, I'm not like a huge tree fan, but how cool does this London Tree Trunk Tour look? The public art project's done by some amazing artists, with the tourism board and STIHL Canada. The artists have taken more than a dozen tree trunks scattered throughout the town, and have created some gorgeous carvings out of the trunks. Seriously cool stuff! Definitely helps them earn that Forest City nickname!